Out with the old…in with the New ECO Krumbuster®! Can your cracker mill produce commercial quantities of crumb and rubber powder? We are proud to be the home of the ECO Krumbuster® hydraulic grinding mill. Call us direct to learn more about this exciting fine grinding technology! The ECO Krumbuster® includes a custom hydraulic power unit 225 kW (300 HP) that powers two Hagglunds hydraulic motors. This powerful combination provides years of worry free operation with minimal operating costs and maintenance. A 762 mm x 559 mm (30” x 22” inch) large roll combines with a 762 mm x 406 mm (30” x 16” inch) small roll to achieve the optimal nip and grinding power for clean crumb and rubber powder. Multiple roll corrugations are available. The ECO Krumbuster® increases production capacity while eliminating over 50% of the weight of conventional mills. Fewer moving parts and long lasting double-row spherical steel bearings provide lower maintenance and less grease costs…improving your business’s bottom line. Take a closer look at the ECO Krumbuster® at work in a fully configured system with connecting equipment. Processup to 3 tons/hour of ¼” minus input. Outputrange is 6 mm – 0.17 mm (4000 – 177 microns) depending on screening. Ideal for processors demanding the best output for rubber modified asphalt applications. At half the size of regular cracker mills, the ECO Krumbuster provides operators valuable facility floor space and requires smaller replacement parts. For an exclusive tour and demonstration of the ECO Krumbuster mill, please contact us today! The ECO Krumbuster® is the next generation of cracker mills. It is the only patented hydraulic cracker mill on the market and has the potential to alter the scrap rubber processing markets in addition to other applications. Many are looking for more effective ways to process other waste and materials with the ECO Krumbuster®. Materials such as plastics, wood, and municipal solid waste (MSW) are being considered. The ECO Green team is currently researching and developing ways to accomplish this. Depending on the required output, the ECO Krumbuster® can process these challenging items at efficient rates. Contact an ECO Green Equipment Representative for more information about this powerful, small, yet efficient fine grinding mill. 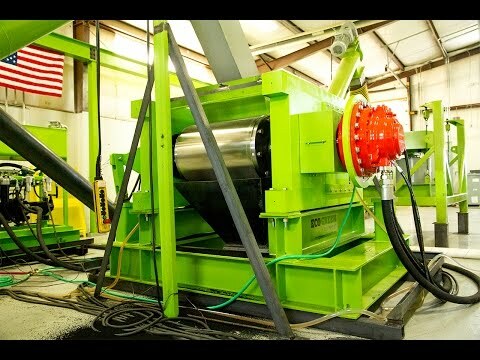 Check out the ECO Krumbuster® module system grinding ¼” minus material. Come visit us to see this system in action!